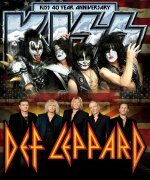 Def Leppard singer Joe Elliott has commented on the Summer Tour 2014 with KISS during an interview with KOMP 92.3 radio. The two bands are set to tour together again - possibly early in early 2015. How was the summer tour with KISS? "Fantastic. Absolutely fantastic. We've known them socially for quite a while you know. I remember I actually sat next to Paul at the Wiltern Theatre in LA about 10, 12 years ago now watching the Rolling Stones. I toured with Gene Simmons in the Rock And Roll All Stars in South America in 2012. I knew Eric Singer when he was playing with Alice 20 years ago. And they're such nice guys. So we kind of knew it would be fun to do because there was no ego involved. You know it was like co-headline everybody gets what they want and what they need and we were more than happy to go on first. Both bands played the same amount of time but there's just no point in arguing. I do think they look better in the dark than in the day so we were fine to let them go on last. It makes no difference to us. But it was fantastic the crowds were great. The camaraderie in the corridors backstage was fantastic. We got to travel with them a lot and KISS for everything that people will say about them. Actually this particular line up was very very musical. They really can play."